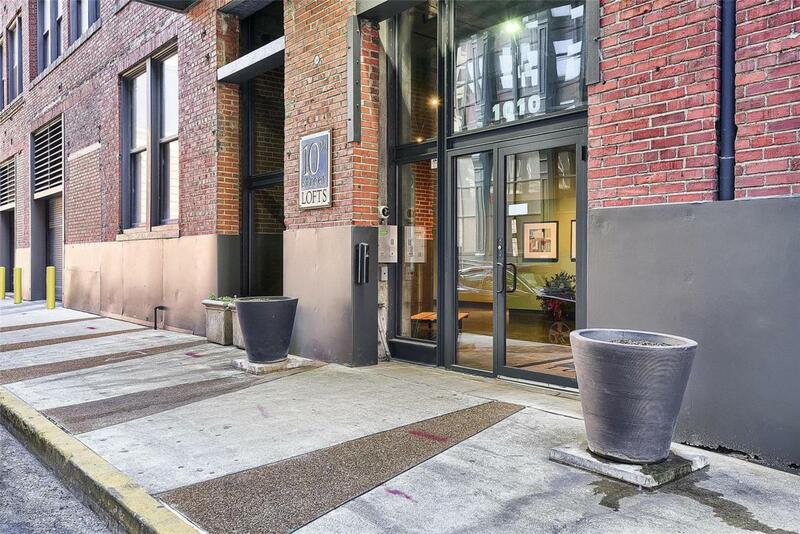 This industrial chic loft exemplifies an authentic urban lifestyle and offers over 3700 square feet of open living. This amazing creative space has hardwood maple floors, large concrete support columns, exposed ductwork/conduit and natural light with full Southern views. The custom chefs kitchen includes a Wolf gas burning range, Viking refrigerator, Fireslate counters, a sleek stainless steel backsplash and a center island with bar top. The master bath has an oversized soaking tub and separate shower. There are two large walk in closets and one has been completely customized. This is an entertainer's dream perfect for dinner parties / social events and also perfect to just relax and enjoy the rare expansive SPACE. Bring your friends and family for summer roof top gatherings overlooking downtown. Includes parking for 2 cars on the main parking level and a storage unit. In the heart of downtown steps from restaurants, bars, coffee shop & the Culinaria grocery market. Call today! Vitals Association Mgmt. Occupancy Restrict Resale Cert Reqd. Listing provided courtesy of Re/Max Gold VI. Listing information © 2019 Mid America Regional Information Systems, Inc.